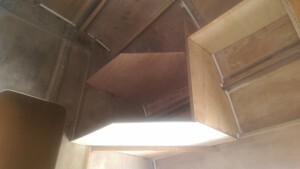 The past week have had some very hot conditions so boat building progress has been measured rather than spectacular. In the hot conditions the epoxy resin cures quickly so any work had to be well prepared. Also as I am doing a lot of small jobs I try to have some extra work ready to use any surplus glue. bog or paint. I am at the stage where I want to prime a few panels with International Interprotect and as I use up a disposable roller with each batch I like to have a large area ready to paint. 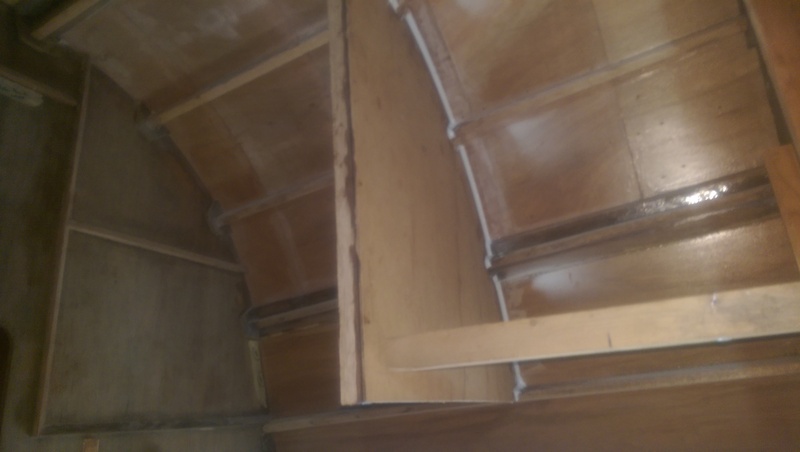 After a few days of sanding in between jobs I have the head ready to paint with any surplus paint and am a couple of hours of sanding away from having the quarter berth ante room ready. The shell of the vanity unit in the head is completed except for one side panel which I need to leave off until the painting is finished. 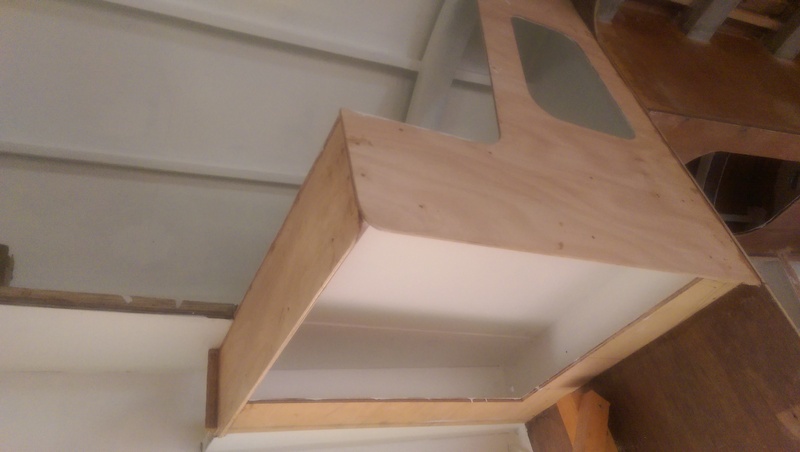 The top of the vanity and the one shelf are grouted and fibreglassed to the hull and have cleats ready to take the side in due course. So that I have places to use up extra fillet bog and extra primer I have started preparing the forward berth ante room. I still have to cut our the four shelves and two fronts but the preparation gives me plenty of uses for the spare bog and paint. In the dim light of approaching evening I set up the laser level to mark the line on the transom for the cleat where the swim platform will be attached. I have agonized about the slope of the platform but in the end accepted Dudley’s plan with it dead level. The other option was to have it follow the slope of the cockpit floor so it would shed water better but I went for the flat option when I realised how much I use the platform to store items I am transferring from the tender. One job I must not forget to do before installing the locker fronts is to cut access holes for wiring, instruments, gas and plumbing and install cable conduits where needed. Quarter berth ante room seat and locker front before cutting the locker opening. Top and shelf in the vanity. 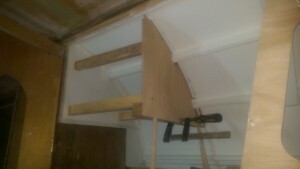 The tiny shelf at the side is a small seat under which will run cable ducts. I will think about a wider seat higher up the hull once the boat is upright. After a relatively quiet Spring series it was good to get a fresh breeze and zip around a longer course. For the race the wind varies between 15 knots to a short peak of 30 knots and Passion with a clean bottom, the small No 3 jib and a full mainsail handled the conditions well. 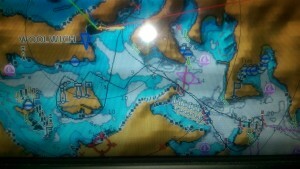 Ignoring the problems with the Genoa halyard we started to leeward of the fleet and just reached Humbug first. Saoirse soon ran over the top of us but then proceeded to take the fleet up into the lee of Greenwich leaving us alone on a course out the middle in breeze. That got us to Cockatoo Island first but we soon had the fleet blanketing us from behind and closing quickly. Saoirse and Irukandji out a little wider came out first but we held off the rest of the fleet. On the wind we were having a good duel with these two and managed to stay close for much longer than expected. The green men on Saoirse seemed to be sailing better than usual but to be fair the conditions suite her non overlapping headsail. 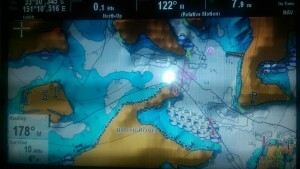 By Goat Island Saoirse had a lead over Irukandji and us on Passion that would hold to the finish line. For a short time on the run from Goat back around Cockatoo Island we carried a 30 knot gust down and looked to make up ground only to lose a similar amount as we negotiated the large fleet of early starters rounding Cockatoo for the beat home. Out third place on time and second on handicap was all we expected and enough to put us in the lead for the series. Frank recorded the tracks on his phone and they show we enjoyed some very good tacking angles against an incoming tide. After the race it was time to go up the mast and unwrap the genoa halyard from the forestay. I think I will enjoy not having a furler on the new boat as it will save eight kilos of weight eight metres up in the air or the equivalent of 32 kilos extra lead on the bottom of the keel. The yellow tracks are from Wednesday 25th Nov and show good angles in a fresh breeze. We made a poor choice of which side or the fleet to sail and suffered when the breeze freshened from the North ahead of the later Southerly change. We were stuck out in the tide in little wind and going nowhere fast. Most of the fleet sought the northern side and worked along the Hunters Hill shore in stronger breeze, a better angle and less tide. We had some company with Tartan, Tashtego and Saoirse on our side and it was only a shore hugging move along Cockatoo Island that allowed us to pass these three. The run down the South side of Cockatoo to Long Nose point and the reach to Goat Island were contrasts. The run was in fading air with the genoa poled out while the last part of the reach to Goat was in a strong Southerly change. Anticipating the change we were well to windward of French Connection and managed to catch her at the bear away around Goat. It was not a pretty sight seeing yacht of all size rounding up in the gusts. The Beneteau 40.7 Fireball from the black fleet kept us entertained and apprehensive as the gybed and rounded up in front of us. In this confusion French Connection and Tartan regained the lead over us and our own several moments of round up let them escape for the time being. Ahead the fleet had run out of breeze on the entry to Humbug so now was our chance to make up time. Running deep into Humbug we tried to go for Onion Point but the overlap from the Green Division Tana kept us above our desired line and later they blanked us on the run to the line. Ahead we could see Gwhizz, who had been well in front of us for most of the race, being overtaken by Tartan while we were lucky to hold our French Connection who was taking our wind from behind. Irukandji and Jedi were officially first and second over the line while Worlds Apart and Faarst Company were missed in the melee at the finish. Our handicap place of seventh will move out to ninth once these two are included in the results. 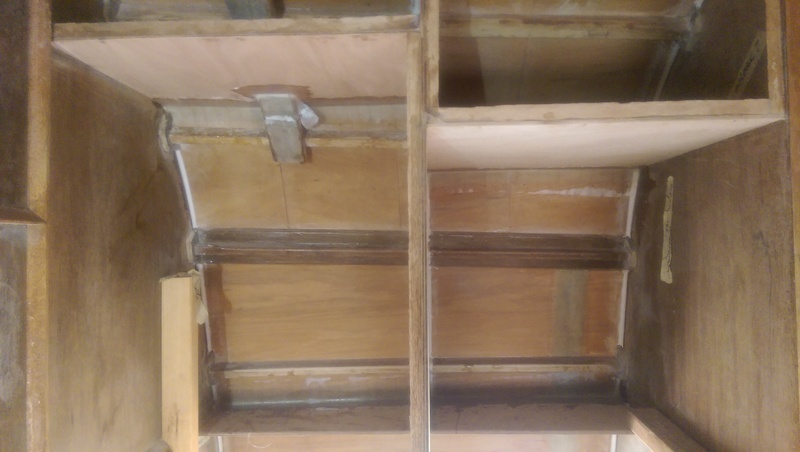 The last little frame has been bonded to the hull. this is the small frame under the chart table seat. 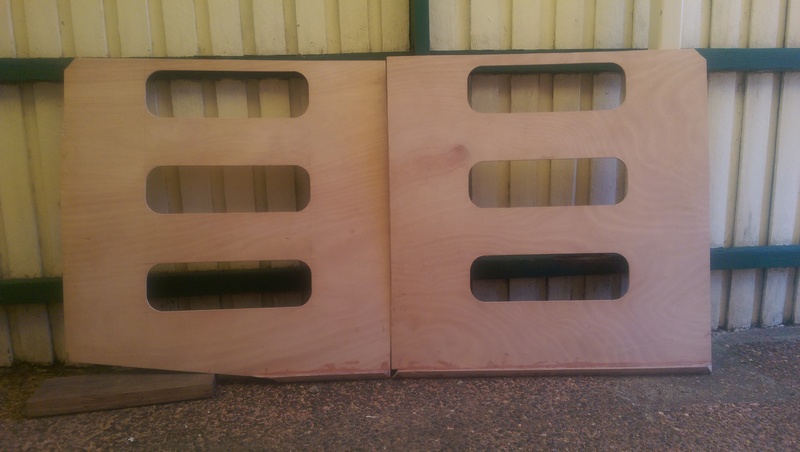 There are three spacers holding it parallel with the adjacent frame. Another photo is the second last frame and it is the side of the vanity in the head. 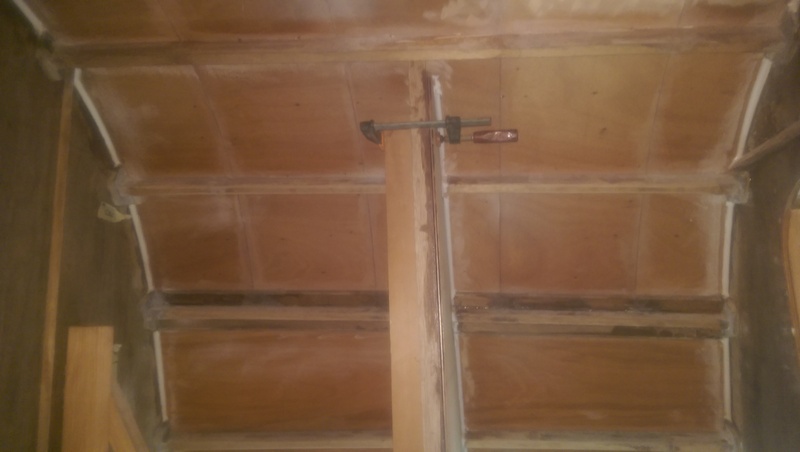 One spacer has been left in place after the glue has dried to keep it steady. And the third last frame was the side of the hanging locker in the quarter berth ante room. I am just showing the top (bottom if you are right way up) part as the light is too strong to show the rest of it. 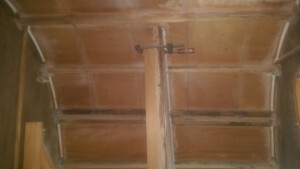 The photos show a range of construction techniques including using spacers to hold frames level with adjacent frames and timbers clamped to frames to keep the plywood straight until the glue on the frame cures. The base of the frame that forms the side of the hanging locker in the quarter berth ante room of our Didi 40 Cr. The space on the right has a small seat at the same height as the bunks. The locker needs just the front to be completed. 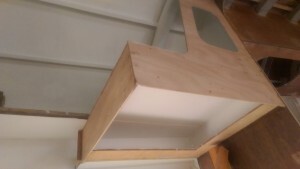 Just the front and the top needed to finish the base of the vanity in the head of our Didi 40 Cr. There will be a shower seat in the area in the foreground. I am currently painting the insides of the lockers in the quarter berth prior to installing the locker fronts. At the same time I have painted the rest of the quarter berth area including under the bunks. I am using International Interprotect over clear epoxy which meant sanding the gloss off the clear epoxy before applying the two coats of Interprotect. The round base of the random orbital sander has been effective in sanding the inside of the radius chine but there is still a lot of hand sanding of stringers. The painting could not proceed until I had glassed the shelves in the locker to the hull. Some shelves are located so close to stringers that I can glass only one side of the shelf to the hull so I am doubling the glass in those cases. Peel ply is proving very effective in holding down the wet edge of the glass and giving a nice smooth transition from bare timber to the glassed area. 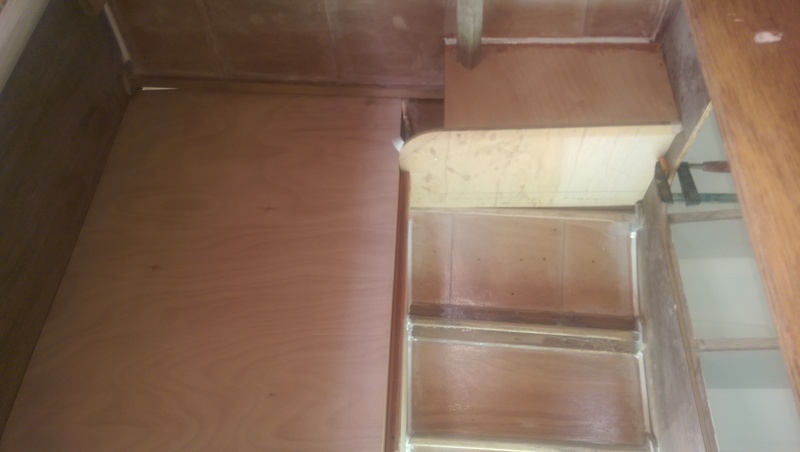 The extra time taken to cut and apply the peel ply is more than made up by the reduced clean up and sanding time. The power board and instrument area behind the chart table is getting the same epoxy glass and paint treatment ready for installing the frame for the panel. This meant finishing the chart table upside down. By my reckoning there are just three frames left to fit. One for the hanging locker in the quarter berth area, one for the side of the vanity in the head and one for the front edge of the seat in the chart area. 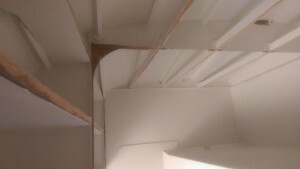 Shelves glassed to the hull in the galley area of our Didi 40 Cr. In the wet conditions we opted for a conservative No 2 genoa for the twilight race. In the light conditions in Humbug we were at the back of the pack and watched Worlds Apart and Irukandji lead out around Cockatoo Island. 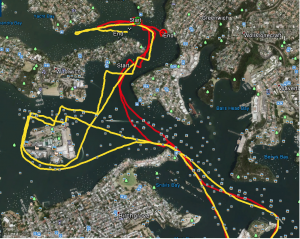 We gained a few places around Cockatoo Island by poling out the genoa and at the turn to go to Goat Island we were on the tail of Gwhizz. The rig we set proved very effective to windward out in the fresher breeze and it seemed that we just needed a favourable shift to pick up Worlds Apart. The tracks show we did well but the outgoing tide plus run off from the rain were big contributors to the good angles. On the run around Goat Island Izzi had a good run and made up ground while on the reach back to Humbug we carried the wind up to Worlds Apart. Going into Humbug we were three deep but Worlds Apart had her nose in front and worked into the freshening breeze first to take second over the line to Irukandji. We were happy to be third over the line and hold out the fast finishing Izzi. On handicap we won by just over a minute which puts us second in the series just one point behind Worlds Apart.